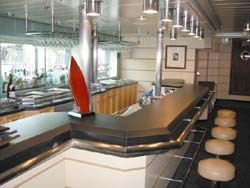 During the spring of 1999, I was asked what it would take to set up a "Web studio" aboard a ship. The idea was simple: a government science agency frequently sends people out to sea to explore various aspects of the coastal and ocean environment, and they wanted to document these voyages contemporaneously using Web technology. People would write up daily logs and essays and take pictures, and these raw materials would be reformatted as Web pages aboard ship, and then be transmitted -- somehow -- back to shore. This article outlines the evolution of that idea from a non-specific speculation to a finished, major Web site. Ships may be large, say, compared to houses, but they are always cramped. Every cubic foot of space has at least one purpose, so the equipment would have to be small and portable. Ships move. This may seem obvious, but they move in many ways. Not only do they travel from port to port, but they also rock, roll, sway, vibrate, and generally do many other things that designers of computer equipment don't usually take into consideration. Electrical power is suspect. 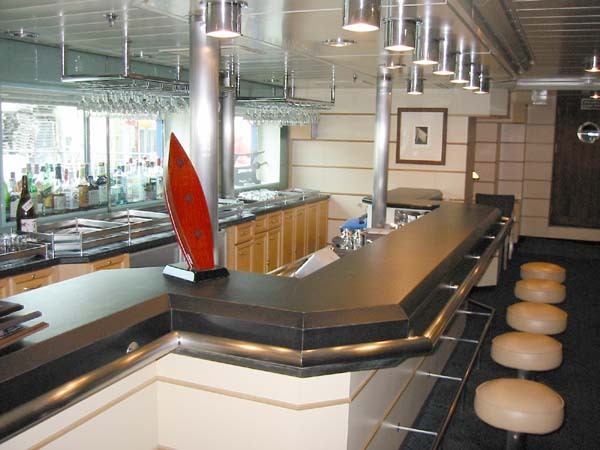 I have never been on a ship that didn't have periodic electrical outages, surges and dips. Also, ship electrical power is often not the U.S. residential standard 120 volt, 60 Hz. ; 220 volt, 50 Hz is just as popular, if not more popular. Transmitting information to shore is a problem. Radio satellite communication is extremely expensive for even a slow link. Cell phones work moderately well if you are in a pleasure craft off a major U.S. city, but most of the ocean fails to meet this criteria. Periodic port calls might allow you to drop off a CD-ROM to be sent by FedEx, but FedEx service isn't exactly ubiquitous over much of the planet, their commercials to the contrary. After several weeks of talking to marine radio operators and ship officers, it was clear that transmitting finished Web pages was going to be a major problem. Sending digital data from sea is still considered somewhat exotic, outside of the U.S. Navy. Most ships use INMARSAT radio satellite telephones, and the telephones, as the name suggests, were designed for voice communications. For ships that purchase the necessary cabling and adapters, you can convert digital data into something the INMARSAT equipment can accept, but the effective speed is only around 9,600 bits per second or less, at $10 per minute. Faster speeds are possible, but this requires much more expensive equipment, and the per-minute charges are also higher. This would provide a nice, robust laptop with the software tools necessary to edit digital images, write text, and create Web pages. The Ethernet hub was included in case other computers were available, permitting high-speed data exchange via Ethernet. Transmission issues were ignored, for the moment. Then, in September 1999, I was asked to look at the recommendations and apply them to a specific mission: a sea voyage to Alaska. Clark Science Center of Smith College, the largest women's college in the United States, was planning to retrace the route of the 1899 Harriman Alaska Expedition. Though not too well known today, the Harriman Alaska Expedition was the last great scientific voyage of the 19th century, and it holds a huge place in the history of Alaska. The participants on the expedition included America's best and brightest scientists, artists and naturalists at the turn of the century, and they spent more than a decade writing thirteen volumes detailing the expedition's findings. Virtually every field of natural science in Alaska today uses the Harriman Alaska Expedition as a reference point in studies ranging from sea mammal habitats to the formation and movement of glaciers. Aside from its contributions to science, the Harriman Alaska Expedition is also interesting from a purely historical perspective. While most of the great "voyages of discovery," such as Captain Cook's expeditions or Lewis and Clarke's expedition, were funded by nations, the Harriman Alaska Expedition was funded by one man, the wealthy railroad baron Edward H. Harriman. When Harriman's name is mentioned today, it is mostly in connection with laws concerning monopolies, as he steadily built a vast railroad empire that dominated the U.S. at the end of the 19th century. (The film Butch Cassidy and the Sundance Kid mentions Harriman several times in passing, as Cassidy's "Hole in the Wall Gang" had a habit of trying to rob his trains.) Harriman's funding of such an extensive expedition was a worldwide sensation, equivalent to a modern computer software magnate's funding of a voyage to Mars. Retracing the Harriman Alaska Expedition offered a splendid opportunity to review the work of John Muir, William Dall, Bernhard Fernow, and the other legendary members of the expedition, only equipped with 21st century scientific tools and methods. Under the guidance of Tom Litwin, Director of the Clark Science Center at Smith College, the project gathered support from a number of organizations and foundations, including PBS (the Public Broadcasting Service), National Ocean Service (part of the National Oceanic and Atmospheric Administration), and the Alaska Geographic Alliance. When first asked to come up with recommendations for a remote Web studio, I didn't have many specifics at hand. Now I had a specific destination: Alaska, and a specific time: July and August 2000. 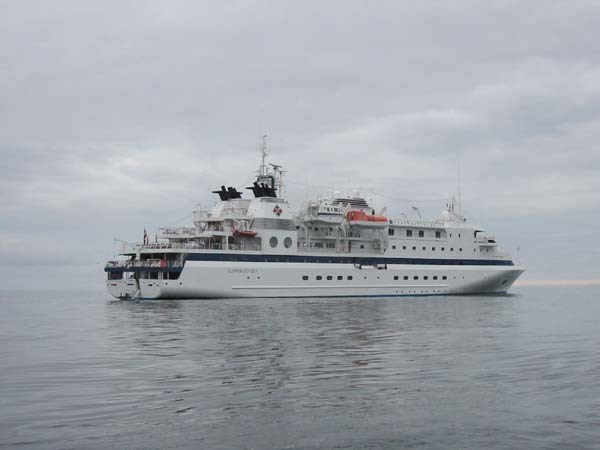 I also had a specific ship: the expedition planned to use the M/V World Discoverer. In conversations with the ship owners, I was also able to come up with specifics on electrical power (220 volt, 50 Hz), radio equipment (an older INMARSAT radio telephone, capable of no more than 9,600 bps transmissions), and space: the World Discoverer was notoriously cramped. I also gained a partner in developing the Web studio. Equipment for the expedition would be purchased by Clark Science Center at Smith College, and at the end of the voyage the equipment would return to Smith. So I sent my wish list to Eric Brewer, Computing and Technical Services Manager for Clark Science Center, and Eric set out to collect the equipment. Heading to Alaska did, however, add to the transmission problems. INMARSAT radiotelephones use a chain of geostationary satellites to transmit and receive data. The farther north (or south) you travel, away from the equator, the harder it is to get a clear signal to the satellites, and during the second half of the Harriman Retraced expedition, the ship would pass north of the Arctic Circle, about the worst possible location for good satellite traffic. In addition, the years 2000-2001 would be peak years for the 11-year cycle of sunspot activity, making this the worst possible time from the worst location to try and send digital information via satellite. My backup plan, sending data via FedEx, was also in doubt: most of the Alaska coastline is far too remote to merit FedEx service. Over the next few months, Eric and I discussed the merits of FireWire peripherals (which were just becoming available) compared to SCSI, and the possible need for a USB-based floppy drive, speculating that some of the scientists might not have any other way to transfer materials. We also debated the merits of Iomega Jaz and Zip cartridges; though these are extremely popular, we wondered whether a recordable CD-ROM drive might be a more durable, and even less expensive archive alternative. I also suggested that, while PowerBooks are more portable and compact, iMacs could do the job just as well and cost less, though they are bulkier. Power and space issues were an ongoing concern. The German-built World Discoverer used European-style round power plugs, and 220 volt, 50 Hz current. Macs have always had "universal" power supplies, so this would not be a problem for them (aside from plug adapters), but some of the other equipment might instantly fry on 220 volts. Then there was the question of how to package all this stuff for transport to the ship and back. I suggested Eric look at Pelican cases. These heavy-duty plastic cases, with custom foam linings, are legendary for their ability to protect equipment during shipping. They aren't cheap, and they aren't particularly compact, but they are rugged. With plans well underway, we received word in May 2000 that the expedition ship, World Discoverer, had sunk. In the middle of a trip to the Solomon Islands, near the World War II battlefields around Guadalcanal, the ship hit an uncharted reef, ripping a large hole in the hull. The captain ran the ship aground, and it sank in shallow water. The nearest salvage companies were in Australia, and by the time they reached the ship, it had been ransacked, and tidal action had caused further damage. Complicating matters was the civil war raging in the Solomons; one of the warring factions had allegedly boarded the ship at one point, looking for supplies and equipment. The owners eventually declared the ship a total loss. In all the planning for the expedition, a great deal of thought had been given to backup plans and backup equipment, but not to backup ships. With the expedition set to sail in July 2000, things were looking bleak; a few weeks later, the expedition was formally postponed until 2001 -- assuming a replacement ship could be found. In the meantime, Eric and I reconsidered our list of equipment. While iMacs might be less expensive, we eventually rejected them for the expedition on the grounds that they were too bulky and too hard to transport, at least compared to PowerBooks. I had a brainstorm that it might be a nice idea to have at least one iMac aboard the ship with a live copy of the Web site, allowing expedition members to follow the journey "on the Web" while at sea. Everyone thought this was a splendid idea -- except that, again, an iMac might be a bit too bulky. I also floated the idea of having a flatbed scanner aboard the ship, mentioning the very inexpensive, very thin Canon scanners; everyone thought this was worthwhile. During the winter, we received formal notice that a new ship, the M/V Clipper Odyssey, would be used for the rescheduled Harriman Retraced expedition in July-August 2001. Built in Japan in 1989, the Clipper Odyssey was larger, newer, and allegedly more spacious than the World Discoverer. The radiotelephone equipment wasn't any faster, but the electrical system on the ship was 120 volt, 60 Hz. Best of all, the Clipper Odyssey was afloat. While there were now "better" Mac laptops available than the PowerBook G3 (now out of production), Eric had already purchased two PowerBook G3s, so we would stick with them. 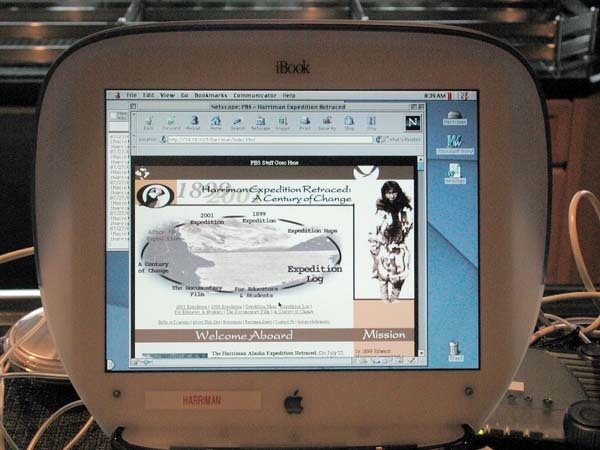 Instead of an iMac Web server, we would use a blueberry iBook (second generation with FireWire) as the Web server. For all practical purposes, an iBook is just a compact, portable iMac, anyway. We would use FireWire hard drives and CD-ROM burners instead of the SCSI-based drives and CD-ROM burners we'd talked about in the beginning. Eric had great fun testing these; we exchanged messages on how to simulate an Alaska ship voyage, and decided that setting up everything on the hood of a car, with the motor running, would be a nice test. Instead, Eric set up everything on his old, vibration-prone washing machine, burning CDs during the low-frequency wash cycles as well as the high-frequency spin cycles. He then capped his testing by moving everything on top of the dryer and burning some more as it spun merrily away. All the expensive, delicate equipment would be packed in three large Pelican cases, each one about the size of an oversized suitcase. Eric had never worked with Pelican cases before, but was highly impressed with their extremely rugged construction and the detachable, heavy-duty combination locks. He speculated that if the new ship sank, the Pelican cases would definitely survive with all equipment in perfect condition. I wasn't sure if this was supposed to be comforting. While waiting for the expedition to launch, the expedition Web site was under active construction for a year and a half. Since the 2001 expedition was following the route of the 1899 expedition, a prototype Web site was set up and packed with a massive amount of material on Edward H. Harriman, John Muir, William Dall and the other members of the original expedition, complete with photos, journal entries and illustrations. National Ocean Service prepared maps of the current expedition route, including elaborate 3D "fly throughs." Lesson plans were prepared by the Alaska Geographical Alliance for use in schools, and information on the documentary film planned for the expedition was also placed on the site. About the only thing missing was, of course, information on the main event, the forthcoming 2001 expedition. In June 2001, Smith College shipped two of the three Pelican cases and several cardboard boxes of "stuff" to National Ocean Service. While I had specified virtually all of the equipment, I'd never actually used the FireWire hard drives or CD-ROM drives, and had only limited experience with the Canon video camera. I also needed to transfer the existing prototype site to the iBook (which would serve as the Web server), and teach my colleague, Alison Hammer, how to connect everything together. The four-week trip would be divided into two parts, and I would serve as on-board Webmaster for the first part and Alison would serve on the second part. Alison had populated much of the Web site, taking raw materials on the original 1899 expedition and turning them into several hundred finished pages, as well as working on the maps and 3D fly-throughs. Accordingly, she was intimately familiar with the contents of the Web site, but had almost no experience with computer networking, had never tried to run Web server software, and had no experience in using digital cameras. While rushing to finish various projects, she spent hours practicing packing and unpacking the equipment, connecting Ethernet hubs to computers, connecting USB hubs to peripherals, starting the Web server software, and figuring out the differences between FireWire, USB and Ethernet cables. We both spent time practicing taking digital pictures and video clips. I was also taking with me a recently purchased office laptop, a PowerBook G4, and my own personal Canon PowerShot S300 Digital Elph. This tiny digital camera (it will fit in a shirt pocket) had only been available for a few weeks, but I was impressed with the clarity of the 2.1 megapixel images it produced, and very impressed with its size and stainless steel construction. Equipped with a 160 MB Compact Flash card (the camera ships with an almost useless 8 MB card) and a spare rechargeable battery, the Canon S300 became my constant companion for the rest of the summer. Aboard ship, I never left my cabin without it. Instead, I'll spend time discussing what worked and what didn't work. The first major hurdle involved finding everything. I took two of the massive Pelican cases full of equipment, plus an extra, ordinary (but large) suitcase packed with the contents of several cardboard boxes, with me on the plane, earning an impressive "excess baggage" charge. Once aboard the ship, it wasn't too hard to track down the third Pelican case (the cases are hard to miss), but most of the supplies sent directly to the ship were "missing" for almost the entire first half of the trip. Aside from missing supplies, there were also two separate and distinct power problems. The first one involved batteries: almost all the equipment had been in storage (the expedition was, after all, a year behind schedule), and the batteries to the cameras and computers had died. While the batteries in many instances were rechargeable, most of the rechargers were missing, as were all the spare rechargeable batteries, and even ordinary AA batteries were nowhere to be found. 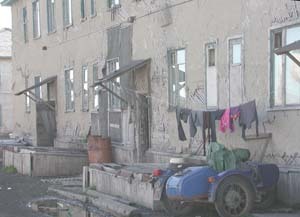 The second power problem involved the ship. Though the ship did, indeed, run on U.S. standard 120 volt, 60 Hz current, power plugs were few and far between. The space offered as a "computer lab" was the ship's "library," called this because it had built-in bookcases, but it also doubled as a bar. 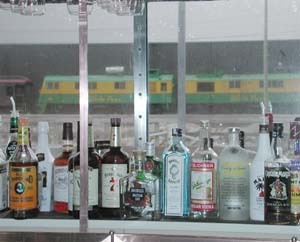 The room had two power plugs: one in a wall next to the bookcases, and one on a wall inside the bar. While most of the supplies were missing, I did find the two APC surge protectors, so promptly plugged one of these into one of the power outlets in the "library." It did nothing. The ship's electrician took the plug apart, declared it was working fine, and we tried again. Nothing. We plugged in a lamp, and it worked fine. So we tried the second APC surge protector: it worked. This was good news, sort of: hours into the voyage, half of all the surge suppressors were dead. The surviving surge suppressor complained of a wiring fault, usually caused by poor or improper grounding. On reflection, we probably should have used regular multiple-outlet power strips rather than surge protectors, since ships have a "floating ground" rather than a true ground. As the ship is at sea, you can't just go pound a metal rod into the earth to ground your electrical systems, and it may be that the dead surge suppressor simply couldn't cope with the floating ground. The surviving surge suppressor managed to last the rest of the voyage, but always indicated a fault. The tables in the "library" portion of the room were small, round and low, designed to be used as coffee and snack tables, and after a couple days were abandoned as unsuitable for computer equipment. Sitting in the low chairs in front of these low tables, trying to type on a computer was sheer torture. This left the bar, and the bar had a nice, slick, flat surface, ideal for wiping up spills. But we didn't really like the idea of putting several thousand dollars worth of computer equipment on a high, slick surface -- especially on a ship that can't help but shake, rattle and roll. The ship's purser solved this by putting "no-skid" on the bar. "No-skid" is a mariner's best friend: a rubber-like, pliable matting, used on tables and other surfaces to keep things in place. After covering the bar with a sheet of "no-skid" matting, the computer equipment was set up on the bar. 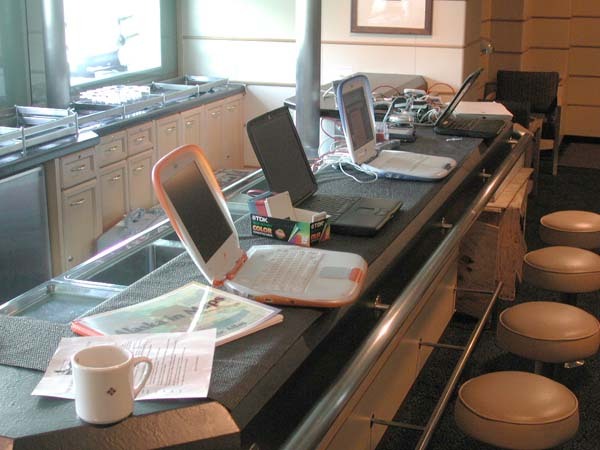 It wasn't the best of setups: the bar stools were designed for drinking, not typing, and most people found it more comfortable to stand at the computers and type than sit down. There were also continuing hassles with electrical equipment: the one surviving surge suppressor did not have enough outlets for all the equipment, forcing a constant shuffle of plugs. Space was also a problem, since the bar wasn't all that long. 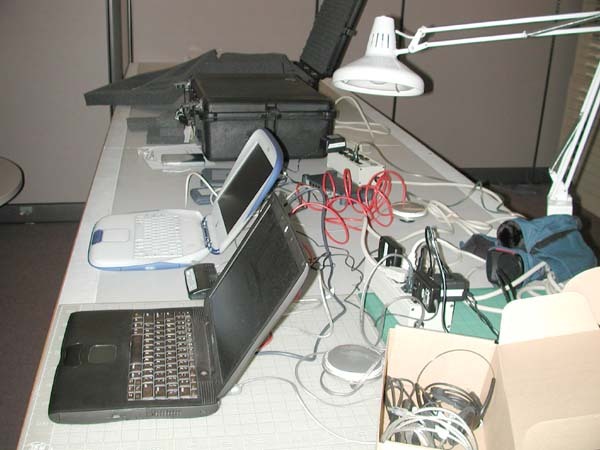 At one point, using both Ethernet hubs daisy-chained into one another, there were eleven computers on this small network: the two PowerBook G3 computers, the iBook Web server, my office PowerBook G4, five other PowerBooks and iBooks brought by other scholars, and two Windows laptops. One individual commented that it looked more like a rugby scrum with everyone crammed together. The shortage of batteries and supplies caused constant problems for most of the first two weeks. I'd check out a Nikon CoolPix camera to someone, and they would bring it back with dead batteries -- batteries I could not easily charge without finding the missing charger. Similar problems plagued the Canon video camera and the Sony cassette recorder, which in addition to batteries were also missing mini-DV and audio cassettes, respectively. The original plan had called for making an archive of the Web site each day, to guard against disasters, but an acute shortage of CD-ROM blanks slowed this process. As expected, all the Macs on the ship (the scholars were about evenly split between Macs and Windows laptops) had no trouble plugging into the Ethernet hub and transferring files over Ethernet. But while PowerBooks and iBooks come with Ethernet built-in, such is not the case with Windows laptops. A few Windows laptops managed to plug into the Ethernet hub, at which point I could FTP their files to the WebSTAR server. Most of the Windows users provided files via floppy disk, and the USB floppy drives were very busy. One individual gave me 44 floppies one night, just before midnight. I had nightmares about floppy shuffling. Some Windows laptops, however, had neither floppy drives nor Ethernet. In one case, the laptop did have a writeable CD-ROM, so we transferred files by creating a CD-ROM on the Windows machine and then reading it on the Macs. There were also numerous complaints that I didn't provide a printer. To be honest, it never occurred to me to provide a printer; I was preparing electronic material for the Web; why did I need a printer? I also spent far too much time fixing people's computer problems. It seemed that almost half the Windows machines were infected with at least one type of virus, and either had disabled or out of date virus checkers, or no virus checker at all. Several users had machines with dead batteries; the machines had apparently been issued from storage, and nobody checked to see if they worked before heading to the ship. Many users appeared to have only a vague idea how their machines worked, and were constantly asking me to find things they'd just written. I ended up missing several events because I was busy helping people recover from crashes, helping them connect their computer to the video projection unit, and similar tasks. In order to protect my colleague, who would replace me midway through the expedition, I started insisting that Alison was not a computer network manager, and people should not ask her to perform such tasks. This, however, backfired: many people came away with the impression that Alison -- who had built the majority of the Web site to this point -- was unqualified to serve as Webmaster, much to our chagrin. Telecommunications were a major problem. The ship's radio operator requested that all outgoing material be submitted as E-mail messages, and the E-mail and attachments could total no more than 120,000 bytes. Trying to disassemble a Web site into 120,000 byte segments -- that someone else had to reassemble at the other end -- was an incredibly time consuming task. Several times the radio operator informed me that the volume of mail I was sending was "too much" and I had crashed the system. I suspect it wasn't a true crash so much as the transmission failed, and he had to send the messages again. A single day's work might require two dozen messages, each with an accompanying 90 to 120K attachment. Since the QuickTime videos I created were 10 to 20 times larger than the maximum attachment size, I went in search of more bandwidth. Many small towns in Alaska have Internet cafes, but I never could find any that allowed you to send attachments. While in Juneau, I was encouraged to try the city library, and walked a mile through light rain to the library. Located on top of a parking garage, the library had several machines open for public use, but you had to reserve them in advance. I waited around for half an hour, and was allowed to use a machine when it was idle, only to find mail was completely disabled on all library machines. Also causing chaos: the expedition started just a few days after the Code Red worm caused world-wide havoc on the Internet, and mid-voyage, Code Red II caused even more havoc. Both these worms attacked Windows machines, and many of the Internet cafes were Windows-only -- and completely shut down. I ended up carrying far more material back with me on the plane than I ever managed to transmit from the ship. Probably the biggest problem was a shortage of time. Alison and I were supposed to build the Web site, but in practice we had to photo-document the journey, edit contributions from others, and then, in the wee hours of the day, try and construct the Web site. The expedition had an official photographer, but he was using standard film cameras, so his photos were unavailable. The digital video camera, while quite easy to use, proved to be more than most people wanted to deal with; even after discovering the DV cassettes, only one student researcher made extensive use of it. Alison commented that "I worked harder than I ever have before" during her two weeks aboard the ship; we rarely got more than five or six hours of sleep, and were busy every minute we were awake. Fortunately, the successes greatly outweighed the failures. The biggest success: nothing broke. All the computer and camera equipment survived the voyage intact. Eric reported that one of the Nikon cameras was missing a lens cap; aside from that, everything survived. The Pelican cases, which went to and from the ship as checked airline luggage, more than lived up to their reputation. 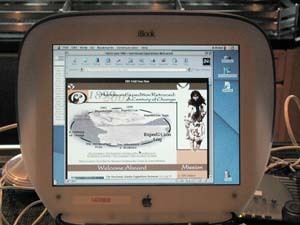 The original plan was to use the iBook as the Web server, and use one of the PowerBook G3 laptops for creating and editing the site. 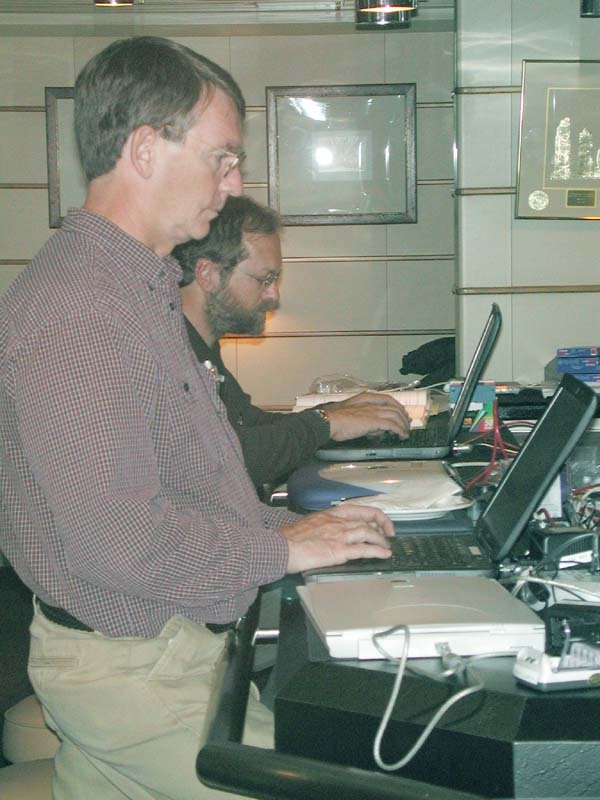 In practice, both PowerBooks were used by other members of the expedition almost full-time; the Web site had contributions from roughly 60 different people during the expedition, and the PowerBooks were also used for preparing lectures, writing field notes, and similar uses. I frequently had to stop people from using the iBook as a word processor, too; while the iBook didn't mind running the Web server at the same time as a word processor, such use prevented people from using the iBook to view the Web site; the screen just isn't big enough for both, even if you could manage to time-share the mouse and keyboard. Alison and I jealously guarded the office PowerBook G4 for our own use, though finding a place to write was a problem. I tried to avoid the library/bar/computer lab as people were constantly asking me to fix things. 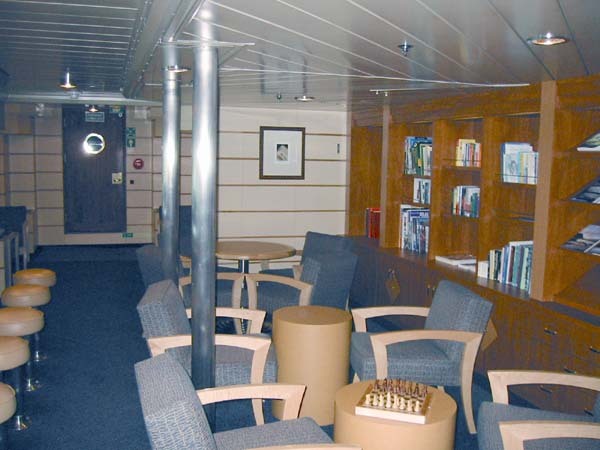 My cabin was full of boxes and cases, with barely room for the bed, so my favorite spot, when it wasn't raining, was the sun deck, an open deck at the top of the ship. With the very late sunsets, I could write and watch the surrounding scenery until nearly 10 p.m., sitting on one of the inflatable Zodiacs. Even after sunset, the screen on the PowerBook offered all the light I needed for writing, Photoshop image editing, and Web page design. I did startle several crewmembers making their rounds late at night; with my face illuminated by nothing more than the screen, they said I looked like a ghost or a demon. Without a doubt, if you need a portable Web studio, a PowerBook G4, with that amazing wide screen, is an essential. Having a live Web site proved to be a spectacular success. In the first two weeks alone, the site had 28,000 hits, a phenomenal number when you consider that fewer than a dozen machines at any time could even see the site. Expedition members often spent hours going over the site, viewing historical material or, just as popular, reading the biographies of their fellow Expedition scholars. When we'd pull into port, visitors to the ship also had a grand time viewing the site. During the second half of the trip the ship visited Russia, and Alison reported the Russians were absolutely fascinated by the computer equipment -- though disappointed they were Macs and not PCs. One Russian customs official made her rather nervous playing with the iBook Web server, and Alison was tempted to ask him to stop, but didn't know how. In fact, if anything, the site was too successful: we were endlessly explaining that, yes, it was a Web site, but it was not connected to the Internet. We would patiently explain that, as far as the ship was concerned, the Internet went from one end of the bar to the other and no farther -- but people would still try to sneak in and read their E-mail, or check the latest news on CNN. Several helpful individuals offered to "share" their Internet accounts if I could only connect them to the outside world, and clearly didn't believe me when I said we were not, in fact, connected, nor could we be. One of the computer-savvy high school students on the expedition reported that a core group was convinced I was deliberately "blocking" access, and tried to recruit him to "unblock" the network. Eric's inspired testing of the FireWire hard drives and CD-ROMs suggested they would be perfect aboard ship, and they were. LaCie's Pocket Drive could fit in a coat pocket, and I often found it convenient to hide away somewhere, prepare things for the Web site, copy them to the Pocket Drive, then carry the Pocket Drive into the computer lab and perform a quick FireWire-enabled update to the Web site. Providing the laptop was plugged in, the FireWire drive would draw all the power it needed from the laptop, so I could plug the drive in, copy files, and unplug it, with no shutdowns, restarts, or external power. Similarly, the LaCie Pocket CD-ROM writer, once the CD-RW blanks were discovered, did a phenomenal job cranking out CD-ROMs. I had worried that the ship's vibration might make it unreliable, despite Eric's washing machine tests, but in fact I had only one bad CD out of roughly 50 attempts. Like the Pocket Drive, the CD-ROM writer didn't need external power, provided the laptop was plugged in to power. This was the first major trip I'd ever taken without a film camera, relying entirely on digital cameras. The Nikon CoolPix 990 cameras were heavily used, by the Webmasters and other expedition members, and the quality was outstanding. Even in the summer, Alaska has very poor lighting, and it gets worse, of course, if it is raining, foggy or misty. Add in the vibration of the ship, or the far more vigorous motion of a bouncing Zodiac, and it was difficult to get clear pictures from even the best of cameras -- but the Nikons did an outstanding job. I was just as impressed with my Canon PowerShot S300 Digital Elph. This tiny little camera, about the size of a deck of cards, did not have the same resolution as the Nikons (2.1 megapixels compared to 3.34 megapixels), but the photos were just as good. Since I purchased a much, much larger memory card, I would often continue shooting pictures with the Canon long after the Nikon was full. Virtually all the video on the Web site was shot with the Canon, too: it can shoot between 10 and 15 seconds of video, with monophonic sound, in QuickTime format. The Nikon 990 can shoot up to 40 seconds of QuickTime video, without sound, but due to the smaller memory cards, I could never afford to use them for this purpose. As expected, the USB floppy disk drive proved to be essential. Every evening, I spent an hour or two collecting floppies, and then transferring their contents to the PowerBook G4. I also used the floppy drives to prepare diskettes for the radio operator. Surprisingly, the Canon flatbed scanner was heavily used: from the moment I set it up, it was busy scanning photographs, books, charts and papers for presentations, and artwork for the Web site. A couple of people used the OCR software included with the scanner to take printed copies of materials and turned them into editable text, which they then used in presentations. Several times I had to clean sand, dirt and plant remains from the scanner, so I suspect some of the scholars used it to scan in specimens they'd found during field trips. Given what worked and what didn't work, I would do some things differently, but most things would stay the same. The software, for example, worked out quite nicely; aside from version updates, I'd probably use the same suite of tools. The biggest change would come in packing. While the Pelican cases did a fine job of protecting the equipment, there were severe problems in packing power supplies, batteries, chargers, cables and consumables (diskettes, CD-ROM blanks, etc.) separately. Much of the equipment couldn't be used until midway through the second week of the voyage because critical pieces were packed in cardboard boxes that looked just like all the hundreds of other cardboard boxes aboard the ship, and it took time to "discover" the missing pieces. I'm still a fan of the Nikon 990 CoolPix camera, but larger Compact Flash memory cards, or multiple Compact Flash cards, were required. When the cards were purchased, 96 MB was considered a large card; today there are 512 MB cards. Larger cards, or multiple cards, mean you can keep on shooting pictures. William Cronon, a well-known environmental historian on the trip, also had a Nikon 990, along with multiple memory cards and lots of rechargeable batteries. In four weeks, Alison and I shot roughly 1500 photos with the Nikon 990 cameras; Cronon shot roughly 20,000 photos, in large part because he had the freedom of switching out full cards for fresh ones. My Canon Digital Elph, thanks to a spare rechargeable battery and its larger memory card, accounted for another 2000 photos and QuickTime clips in two weeks. In short: bigger is better when it comes to memory cards and digital cameras. While the PowerBook G3 and iBook laptops performed flawlessly, today there is a better machine: the new model 2001 iBook. With their more compact size, speedier processor, higher-resolution screen, and built-in read/write CD-ROM drives, they would have been easier to carry and stow away, and would have eliminated the need for the external FireWire CD-ROM drives. Finally, I would have asked for more help. There was simply too much to do for one person. In particular, we failed to explicitly assign someone to take digital video, so hardly anyone did. We failed to explicitly assign someone to carry around the Sony cassette recorder and record whale sounds, or bird sounds, or interviews, so nobody did. While the digital cameras were used extensively, they were often used to document specific research projects rather than the expedition itself, leaving the Webmasters to do most of the photo documentation as well as all the photo editing and Web editing. The observations and opinions expressed in this article are those of the author alone, and do not represent the position of any institution or company mentioned.